This semester, UD Senior Chelsea Adebiyi has been completing a 360-hour field placement with Lori's Hands. We sat down to talk with her about her experiences working with our clients. CA: My name is Chelsea Adebiyi, and I am a senior Health Behavior Science major; I also have a minor in Public Health. After graduation, I want to become a Pediatrician because I love working with kids and with people in general. LH: Why did you get involved with Lori’s Hands? CA: I heard about Lori's Hands my freshman year. It intrigued me but I got involved with other activities and so didn't become a volunteer right away. As I was planning for my senior year internship, I thought of Lori’s Hands as a great opportunity because I love what Lori's Hands does. I love that what we do puts a smile on clients’ faces. It’s awesome how clients talk about Lori's Hands. I don’t think we always realize the impact that we have on clients until we have the chance to talk with clients one on one. I look forward to my regular client visits. LH: Speaking of your visits, what do you do with Lori’s Hands? CA: I have several different clients whom I visit on a regular basis. One client is blind; she has aides who help her, but she lacks social support. She is 91 years old, and we visit with her and she talks with us about her life. We have conversations about when she was a child. I love it because she tells us about Presidents from throughout her lifetime – things that I have only read about in history books. She also tells us about the reality of aging and how difficult it can be. I love that we get to be there for her and try to make things more comfortable for her. She lives by herself and doesn’t have family close by, so I know that visits from Lori's Hands volunteers mean a lot to her and provide her with social support she's otherwise lacking. I also have a client who has MS. She has some difficulties with mobility, but she’s very mentally sharp. Sometimes she asks us to help organize things for her, and other times we play games and sit and talk with her. Another client I visit likes everything to be neat and organized, so this is how I help her when I visit. My last client I visit every Friday, and I always look forward to seeing her. She’s so vibrant and happy about life – she largely attributes this to Lori’s Hands because we were here for her when her husband passed away and she became sick. When she didn't have many people to turn to, she could rely on Lori's Hands for support. LH: It sounds like you help Lori's Hands clients in a lot of different ways and have done some very meaningful work. So tell me more about why you care about Lori’s Hands mission. CA: Now that I’ve visited clients, I see so much more of the impact Lori's Hands has, and the work has become much more important to me. I see how what we do makes a real difference in clients’ lives. LH: You have worked with clients facing a variety of health challenges. What has this taught you about living with a chronic illness? CA: I’ve learned that it’s hard but it is more manageable when you have people around who care about you; it helps you not to focus on what’s wrong. You can still have a vibrancy in your life. I have also learned about new ways of adapting to and interacting with people. For example, if someone has limited hearing, I’ve learned how to speak with them so that they can understand me. I have learned that little things can be significant for a client; for example, I always make sure that there are no tripping hazards for my client who is blind, and if I put something in the refrigerator, I need to tell her where it is in the refrigerator. I have learned how to be more personable and relatable; I have learned a lot about empathy. LH: I imagine those are skills that will be really important as you step into the medical profession. What do you think in particular you’ll carry with you from your Lori's Hands volunteer experience? CA: I wish I could still volunteer with Lori’s Hands after I graduate. You can’t outgrow Lori’s Hands. If I was going to still live in Delaware, I would still volunteer. Something I will take with me is all of the experiences I have had with clients. The volunteer work I have done has been important; I originally thought I would just be helping people with activities they had difficulty completing themselves, but my experience has been much more significant than that. I have made lasting relationships with the clients, far beyond the volunteer work that I do. 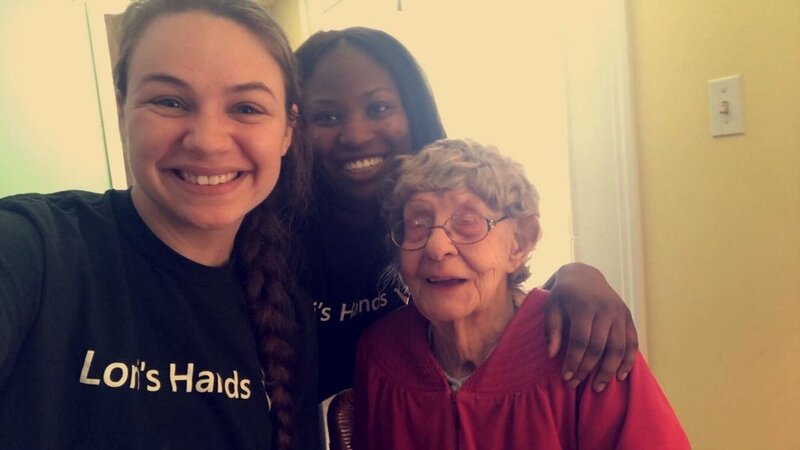 Marina and Chelsea take a moment during a visit to snap a selfie with a client.